"During 1996 several breakthroughs occurred in the Awakening. Genuine implants were dug out of contactees and examined by scientists, real UFO's were captured on video and shown to the public by CNN, and a crop circle was filmed in the making. Filmed under circumstances that could hardly be questioned, the video nevertheless was roundly criticized and pronounced to be a fake, which it is not! "Where crop circle fraud, or at least fraudulent claims, had been running parallel with the real thing in England, here was the real thing! It has taken a bit for the reality of that fact to sink in, but the validity of the video is now beyond dispute. It stands as testimony beside the human witnesses who have stated that crop circles are laid down almost in an instant, something no human hand could accomplish." "Where crop circles do occur worldwide, they receive more press and attention in certain countries, most notably Britain. Crop Circles occur just as often in third world countries, but where one is faced with starvation, crop circles take a back seat. Long after the harvest, there is little to investigate. Britain was once the supreme superpower, ruling the waves with her ships, and her people long yet to be first at something. Consequently, due to the press that is given crop circles in Britain, some of the best crop circles have been placed there in anticipation of good press coverage." "Characteristic of the recent hoaxes, all of which have appeared in Witshire county in the UK is their preference for straight, rather than curved, lines, and inclusion of mazes. No legitimate diagrams to date have included a maze, anathema to the intent of the circle makers which seek to educate, not confuse, mankind, yet hoaxes almost prefer them as a maze has straight lines. Hoaxes also tend to be small in size, or in locations distant from public view. Hoaxes lack the characteristics of legitimate circles which are crop bend at the growth nodes, not broken, and crop laid in different directions overlaying each other, and precision in line and curve. "What is to be learned from the hoax circles? They take the symbolism of legitimate circles and distort them, not unlike the disinformation distortion given our words. Legitimate circles do not include faces, as in a prior year hoax of the face of a Zeta or Art Bell, not mazes interpreted to be binary or other code. Hoaxes hope to grab public attention by such gimmicks, and when revealed as hoaxes, cast aspersions on all circles. Legitimate circles have a resonance with other legitimate circles, like the cadences of a symphony, all building upon one another." "In addition to laying down original hoaxes, the hoaxers employed in Wiltshire county in the UK have been assigned the task of ruining legitimate designs. Where Golden Hill was taken to be manmade, because the hoax team was seen emerging from its location, this is a legitimate circle. The team left because it did not lend itself well to sabotage. "Note the similarity to circles following in Beacon Hill and Westbury. A key indicator of sabotage is change after the creation date. Legitimate circle makers have no reason to delay, and their trademark is to create intricate circle over a broad area almost within seconds. Their design is in the computer, and it takes but the release of a switch to start the sequence, whereas hoaxes take time. "An example of a sabotage is Silbury, where the hoaxers hoped to enhance their reputation by claiming this large circle. Here the sabotage resorts to lines and mazes. Contrast this with the belated change to Tan Hill, where the original makers returned after aerial photos had been taken of their intended message to create a contrast to the hoaxers. See the difference?" "Regarding the Chilbolton circles, which show a face and a pattern akin to binary code or radio - there are several indications that these are man-made, not genuine. They do not follow the previous pattern, which is mysterious and circular, not rectangular and obvious. They are crudely done, with broken grain which will not grow again and grain bend in all directions. They are not the size of genuine circles, being tiny not massive, and thus able to be done by man in his fakery. "So what was the point? Why were they done? The early debunkers claiming to have done the circles with boards, in England, got lots of media attention but were not, frankly, believed by the public. Those running the debunking program wished for a fresh start, and these circles are an attempt to get back into the media. After awhile, the plan was for them to come forward and present video of the making, and thus debunk afresh that crop circles are alien." "We have pointed out that a hoax can often be identified by being small (so the hoax can be accomplished in a short time) and full of straight lines (as these are easier for man to lay out). Obviously, broken rather and gently bent grain is a big clue too. The small keyhole laid at Yarnbury Castel is a hoax, as was quickly identified on May 16, but CropCircleConnector changed its tune because many argued the case that there were similarities to a 1998 case. Those doing analysis on crop circles are many, and many strong egos are involved. Thus, arguments sway in all directions as to what the official determination should be." "Crop circle hoaxes are a type of disinformation in that they purport to be something they are not. We have mentioned that there are clues that a crop circle is a hoax, characteristics that allow them to be easily recognized. Hoaxes include many straight lines and mazes where legitimate circles are symmetrical circles almost exclusively. A third clue is how the grain is laid. Though hoaxes recently have become more sophisticated, able to create perfect circles, they still cannot lay the grain down by bending the grain at the nodes as legitimate circle maker can do with a growth stimulant. The grain is crushed, and not interwoven, in hoaxes. Accordingly, Charlbury, Etchilhampton, East Kennett, and the Roundway Hill laid on July 25 are all hoaxes." "This newest, and magnificent, crop circle shows a Closing Circle, not the relationship between celestial areas of influence only somewhat affecting each other. Notice the closing circle, the tightening noose. What is this saying? That the time for distance, and nominal, affect, is past. It is saying that the hand that was only swatting at you, from afar, causing a whistling wind past your ears, is now gripping you by the ear, and shaking you! No more wondering about equilibrium, and what we mean by this when we explain how a planet so far away can affect your weather. Now you will see this monster approach, and your governments quake as the increasing earthquakes, as it is upon you! This is what the newest circle in England means, in case this meaning escaped your notice." "The key shape or symbol appearing in some crop circles is an assist to indicate the direction of motion when this might not be obvious from the diagram as a whole. The motion implied is retrograde, the rotation and orbit direction that Planet X takes during a passage. Without the key, Oldbury in 1999 could be taken that way, or the opposite way, that the circle is turning in a clockwise direction, although the counterclockwise direction has more bite. The key was used in 2003 also, to show the direction of sweep during magnetic clashes. "Jubilee in 2011 is showing the combined effect of the Earth wobble and the regular assault from a retrograde approach of Planet X, like a boxer socking an opponent in the jaw from one side, repeatedly, every time the opponent recovers and reels around again." The following chronological summary contains authentic crop circles interpreted by the Zetas from 2010 through 2011. Crop Circles Part 1 provides an introduction to crop circle language and contains crop circles from 2006 through 2009. Crop Circles Part 3 explores the development of crop circle hoaxes and authentic crop circle defacing, and includes crop circles from 2012 to the present. Many thanks to Nancy Lieder, the Zetas and the Circle Makers for their tireless efforts to alert humanity of the coming times. "The circle depicts the magnetic grip that Planet X has upon the hapless Earth, and the degree of sway that can be anticipated during the last weeks when a severe wobble will ensue." "This crop circle is depicting the retrograde orbit of Planet X, clockwise, and the 3 planets that are currently caught in front of its passage - Earth, Venus, and the Earth's Dark Twin. All 3 of these planets are of equal size, but only the Earth remains trapped during the passage and experiences a pole shift. The other two escape the squeeze before or during the last weeks. The circle is showing that regardless of what direction Planet X approaches the solar system, this squeeze occurs." "Upon examining this crop circle, one will find that the 12 sections never have a line-notch that matches a line-notch on another section. There is no continuity, from one section to another, in these notches. What do the 12 sections represent, and what do the notches represent? Since the Gregorian calendar is universal, we confirm that it is months. The notches represent significant seismic activity, or plate movement. This tends to get hot in one area, and then the stage moves to another area. "We are not yet at the point, as will be the case certainly during the pole shift and may be the case during an 8 of 10, where significant plate movement in one area does not start and stop, but just keeps going. Rock fingers are still holding the plates in their current positions, in the main, so there is some movement and then a halt as new catch points take hold. As to whether this crop circle, showing 12 month slices, indicates we have a year of this type of halting plate movement to anticipate, realize that this circle could represent months past, or even a year of past activity. We are certain that there will be a flurry of analysis, thus, on just what pie slice is what month, and just what notch is what earthquake or stretch zone movement. But we predict that no timeline clues will be able to be discerned with certainty from this crop circle." "The San Benigno crop circle is a representation of what Planet X will look like after the passage, during the months after the passage. The Earth will again start orbiting the Sun, and the Dark Twin will fall back in their shared orbit to disappear once again behind the Sun. Planet X has a retrograde orbit, clockwise. The double helix was very evident in early photos taken of the complex when it was inbound in 2003, and forms the wings of the Winged Globe as the complex has appeared on SOHO lately. Planet X leaves the solar system in an almost straight line, outbound from the Sun, but in the view from Earth appears to curve as the Earth is then moving in its curved orbit around the Sun. "In a similar manner, the Basiano crop circle is depicting what to expect from the planet Venus. Venus will be squeezed so tightly in the cup toward the Earth, that it will appear to come from the Sun, no longer in its orbit as viewed from Earth. It will loom large as it is squeezed toward the Earth, and then escape to resume its normal orbit, a counterclockwise orbit." "Silbury Hill is a series of overlapping circles, trapped inside a larger circle. When a confined circle is present, it represents orbit lock. There are 3 planets caught in the cup in front of Planet X - the Earth, the Dark Twin, and Venus. All 3 are being pressed together, with resulting distress and great drama in the skies in this matter before the pole shift occurs." "The small circle, looking like a sperm approaching an egg, again shows how the 3 planets in the cup cannot escape the approaching Planet X. They are passive while Planet X active like the sperm, and moving." "This is another representation of the clash between Planet X and the three planets caught in the cup in front of Planet X. Planet X has a retrograde orbit, and rotates in a retrograde manner too, clockwise. As with the sweeping arms of the Sun, invisible to man but sweeping the planets along in their orbits, counterclockwise, along with the rotation direction of the Sun, Planet X has such an influence. All rotating planets have sweeping arms, to some degree. This clash is part of what causes the Earth's rotation to slow to a stop prior to the passage, when the Earth and Planet X come close to each other." "Planet X has a contorted path coming to its current position - a creep past the Sun and thence outbound. In the view from Earth on the website Nancy maintains, it first moves left, then up, then left some more, then right, then down. All this only for the years 1983, when Planet X was first sighted inbound by the IRAS team run by JPL, to 2003 when it arrived to creep past the Sun. If you consider this path from an overhead, rather than head on as Nancy's diagram shows, then you see this contorted path, exactly. When Planet X stopped the Earth in its orbit in December, 2003, Venus was likewise halted and trapped in the cup, and this is what you see with the two small orbs inside a circle. By June, 2004 the Dark Twin had arrived, coming up behind Earth in their shared orbit, so there were 3 planets in the cup in front of Planet X. In July, 2004 "Planet X was close enough to the Earth, having the Earth in its grip and squeezing these 3 planets before it in the cup, that a change in the regular reaction of the Earth to the Sun's sweeping arms was noted by Nancy. As stated "A pattern of 11-11-8-8-8 days between Sweep Sets with a One/Two/Three jolts in each set was noted from April through June but by mid-July the sweep pattern changed to include a Four/Five, the almost continuous activity predicted by the Zetas, so it became difficult to discern the sweep sets." At this point, in the crop circle, Planet X is near the Sun, creeping past the Sun, and time stands still for this crop circle, awaiting the time of the outbound passage. But there is a mirroring of activity on the outbound phase. For the year following the passage, the planets that had been caught in the cup right themselves and find their old orbits and place, while Planet X disappears from view." "Poirino is reiterating the orbit lock concept, as a backdrop, so the focus shifts to what is different. Those unaware of the presence of Planet X, but nonetheless aware that the Earth seems to be in a period of intensifying earthquakes, irregular weather, and a rash of sinkholes, are perturbed. They are on the one hand being told that all is normal. But they sense this is not so, and are subconsciously reaching out for answers. This crop circle is simply telling them that their sense that matters are not normal is correct." "If you follow the chain as it goes round both centers, it will first go in a counterclockwise manner (a normal rotation for the Earth and your solar system) and then in a clockwise manner (the retrograde orbit and rotation of Planet X). They clash, yet they are chained together!" "Since a timeline is not to be revealed, this crop circle does not indicate a timeline, no matter how much it might be scrutinized. Some pie pieces are connected by an outer ring, some are not. Those that are connected have a pattern of 5 pie slices connected, in the main, though the first connection is only a 3 and the outer ring connects all. "This is what is happening during the Earth changes. There is a domino or ricochet effect that is building. Some Earth changes are present almost continuously, such as the continuous and increasing volcanic activity, while others such as large tsunami seemingly start and stop. Some Earth changes go hand in hand with others, such as the occurrence of sinkholes in China provinces with the sinking of the Eurasian Plate tongue and the islands housed on that tongue, along with the tilting of the Indo-Australian Plate under India. But by the time of the pole shift, the Earth changes will not only be continuous, they will be connected." "These two crop circles are related and sure to catch the eye of those faithfully watching. Note the differences. In 2005 there was a sweep, front to back, where in 2010 there is a swirl going round and round. What does the eye in the center of each circle represent? Planets in their orbits are swept along by the sweeping arms of the Sun, as we have explained, but when doing so encounter matter in their way - subatomic particles they must plow through. During the time when the Earth and Venus and the Dark Twin are all crowded in front of Planet X, and Planet X itself is almost stalled as it tries to push past them, this is a crowded particle field in turmoil. Rather than the usual setup where a planet plows through the field, the particles flowing past it, all four of these planets find the particles crowded in front of them and not moving. "An analogy would be to consider snow plows on the road, clearing a path. The snow is cast to the side so the plow never has more than a certain amount in front of it. But if several plows approach each other they will be heaping snow in front of each other, and all begin to stall. This crowding is what ultimately releases both Venus and the Dark Twin from their trap, as they move toward the point of lesser crowding. At present it is the eddy flow coming round the sides of Planet X that dominates, but this equilibrium will soon change." "In the July 2003 Tistead design, there is a clear clash in the middle where two planets with different orbit directions and rotation directions encounter each other. In 2003, this happened when the Earth encountered Planet X in her path. What is different 7 years later in July 2010? The Earth is locked in a regular serpentine roll with Planet X, the clash of their magnetic sides sliding past each other in a regular rhythm. The Earth's daily wobble is occurring regularly. But this has an end. "There are 7 balls in the Sutton design, and 7 years have passed, almost exactly, since the July 20, 2003 date when Tistead was laid. If the serpentine dance is to end, what does this mean? It is no longer a dance, with smooth rolling adjustments, but a different kind of clash which is not smooth but rather violent. This is what awaits the Earth, soon." "There is a progression from the May 29, 2010 crop circle in Italy to the July 8, 2010 crop circle in German. The progression shows the crowding from one side extreme, as though the 3 objects trapped inside the outer circle were desperately trying to escape from a presence. The 3 objects are of course the 3 planets trapped in the cup, with the outer circle representing the cup they are trapped within. The progression shows how rapidly this press is proceeding, at the present time, squeezing them together!" "Bagnaria in Italy does indeed imply an increasing presence, first double, then triple, as in three. Could this be referring to the crowding in the cup caused by the presence of not only Venus but the Dark Twin of Earth having arrived to be trapped there? This is indeed a valid analysis, as so many crop circles lately have been warning of the coming time when these other planets will loom large in the skies, just prior to escaping the cup. "Siegburg in Germany also implies an impression of being squeezed into one spot, particle crowding. "Goss refers to the vibration of these many planets in the cup, as other crop circles have recently. "Schneen in Germany is of course the spiral seen in so many petroglyphs and associated with warnings about floods, the death of fish, and signs from the skies. Man will see more of these spirals, as occurred during the Norway swirls." "There have been requests in recent questions tying to establish how large Venus and the Dark Twin will appear prior to escaping the cup. This crop circle speaks to that issue. Earth is centered and as she is squeezed, out pop her sister planets, escaping. Are we saying that these sister planets can loom to look as large as, or larger than, the Moon? That's what is implied, yes!" "Clearly in this circle of 8 orbs, one is smaller and one circled. But what does this mean? These are neither representative of months or years or any individual planet placement, but a basic lopsided force in the general particle flows arrangement in your solar system at the current time. This is not on opposite sides of the solar system, but at a tangent somewhat to one side. "Where normally the Dark Twin is on the opposite side of the Sun from the Earth, it has come up behind the Earth in their shared orbit. Venus likewise does not move to the other side of the Sun during her orbit, which is halted by the presence of Planet X too. Then add to the particle crowding the presence of Planet X, which prevents particle flow in that direction, so that a clog has formed midst these four planets. "Just as earthquakes often have a sympathetic reaction in the magma at a tangent to the original quake, this particle clog has a reverberation at a tangent to the Sun." "As Planet X closes the gap between he and the Earth, their magnetic fields increasingly clash. This has forced the Earth into a temporary lean to the left and even a temporary lean into opposition during these past few months. "We have described this dance as a dither, as a move in one direction creates crowding that causes a bumping action, thus a move in another direction. Woolaston is trying to relay that picture, a reverberation in all directions because of the magnetic field clash. "So what are the tiny dots? These represent the Earth's Moon, which likewise reacts to the particle field crowding with an eccentrically tilted orbit." "Both these crop circles have different meanings. The first, in South Moravia, indicates by the black and white flipping a rapid change. This crop circle is describing the severe wobble that precedes the static lean to the left. We have not put a time period, a day or week length, to this severe wobble but here you are given it - 9 days. The Egyptians described this time as the Earth "spinning round like a Potter's Wheel", meaning flopping from side to side. It finally flops to the left and there stays until the N Pole of Earth moves away into the 3 days of darkness. For those looking to pin down the time frame during the last weeks, this is another piece of the puzzle. Vysocina is showing a series of eclipses, where one planetary body eclipses another. The first, in the central circle, shows the size of Planet X as a Second Sun seen from the northern hemisphere as the Earth and Planet X draw closer. The radiance of the Sun is eclipsed by this. What lies behind represents an earlier stage, when Planet X is less visible in the line of sight as viewed from Earth." "If the Chirton crop circle is representing how Planet X and the Earth are chained together, while clashing, then what would Planet X as an anchor represent? We have explained that Planet X has two dominant Moon Swirls coming from either side, which gave it the appearance of a double helix in early photos in 2003, or the Winged Globe appearance on SOHO. But there are many Moon Swirls that trail behind Planet X as it travels, and these will be visible to mankind during the passage. The most distance Moon Swirls will appear to be at an angle, due to the fact that the Earth will again be orbiting the Sun, and thus be seeing the Planet X complex from a distance as it retreats from the solar system." "If the Anchor crop circle was showing the Planet X complex as it retreats, White Horse is showing it as it approaches. The minor Moon Swirls that composed the tail of the Anchor are very distant and hardly visible. The two main Moon Swirls will be seen on either side, flaring back. And the crowding of magnetic particles in front of Planet X as it points its N Pole toward the Earth is shown, so that Planet X itself is almost repulsed by this crowding, pushed back in this cloud of magnetons, so is moving slowly!" "As with Woolaston, this crop circle (Eastfield), which is almost identical, is depicting the current state of particle crowding and bumping action around the Earth of late. Earth has been wobbling since 2004, tilting her magnetic N Pole away from Planet X and then, when it is protected by the horizon, allowing it to bounce back. The larger circles represent that wobble, which has allowed the Earth to deal with the magnetic approach of Planet X since its arrival into the inner solar system. The larger circles represent these two postures of the Earth, forward and back, the daily wobble. What appears to be lettering on each half of Eastfield represents the various changes in this wobble, which at first was a S Pole tug, then a N Pole push, and has varied in strength and shape as the wobble years have passed. "To either side are smaller circles, which as we mentioned during Woolaston represent the temporary lean to the left or into opposition. These are superimposed on the regular daily wobble, and persevere for days. These are larger in Eastfield than they were in Woolaston, because the frequency and severity of these temporary leans is increasing. Of course, the Moon hardly knows where to position itself, and the Moon's orbit will be increasingly erratic because of this. This is represented in the center of the Eastfield diagram. "What does Chalkpit represent? By moving the side circles, which represent the temporary leans either to the left or into opposition, it shows an intrusion into the daily wobble. Instead of being pushed this way or that, in turn, it will be the daily wobble being rattled. If you pick up a box and move it from place to place, perhaps gently and then even with more force and shoving, you would likely not break the contents. But if during picking it up and moving it you rattle it, you are going to break those contents. We have predicted plate movement starting, major plate movement. What would cause this? Certainly not the gentle wobble that has been in place since early 2004. Something different has to occur!" 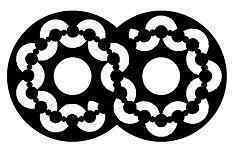 "What does the progression of overlapping orbs represent? It is a growth, in a day, not only of the encircling reach of the top orbs, but of the size of the orbs themselves. This pictorially represents what we have been trying to relay regarding the new Earth wobble, which we will now start called the Earth rattle. The Earth moves in several directions at once, or in quick succession, jerking back and forth to meet often conflicting directives from the frantic magnetic field of Earth which is likewise trying to meet quickly changing directives from the dominant magnetic field of Planet X. The encircling reach represents a change from where the Earth had been only moments before, so that the past affects the future. The Earth may be in the middle of her usual Figure 8 wobble pattern and suddenly get pushed into opposition, for instance. The force and frequency of this type of rattling of the Earth will continue to increase." "As tempting as it may be to align these two crop circles with the current heat wave pattern, this is not the sole message. Note that one of the circles is laid across the tram lines, but the other is laid at an angle across the tram lines, nor are either of these fields arranged so that their tram lines are parallel to each other. All this is by design. "We have spoken of the daily wobble being affected by temporary leans to the left and leans into opposition, all amidst the daily wobble and quickly switching about. This will of course affect the heatwaves that have beset the northern hemisphere this past summer. Are the lines on the circles equivalent to latitude lines? They count 16 lines in both cases, in both circles. If the center one is the Equator, and the large circles to be interpreted as heatwave centers, then this would place the heatwaves at latitude 70! At present, this is not the case. "Could matters go to this extreme, at least for hours of daylight during a tense lean into opposition where these upper latitudes were baked in direct exposure to the Sun for long hours? This is what is being implied here. Why are the circles not parallel to each other, nor even evenly crossing the tram lines? If you look at both together, as they are laid, you can see the degree of tilt a wobble might take during such an extreme mixed bag where leans to the left and into opposition are combined with the current Figure 8 of a daily wobble. This is a 45° variance! And all this is not yet the anticipated severe wobble which will lead into the last weeks. This is just the Earth changes, escalating!" 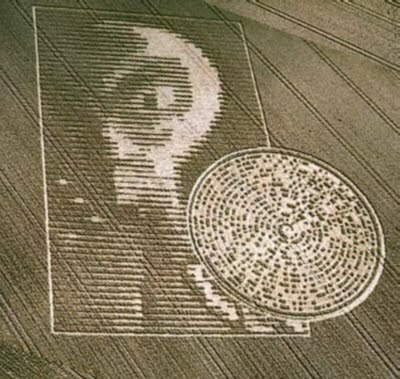 "The Czech crop circle is showing the various positions that the Earth can be expected to assume in the near future, as it lurches back and forth in a rattled wobble. The arc overhead shows the swings, and in particular the degree of swing that might occur. The globe under the arc is the Earth's posture at present, during mid-summer in the northern hemisphere. Assume Planet X and the Sun to be overhead. The S pole is shown as the white dot, showing that for the southern hemisphere, it is now winter there. On the right hand side of the arc is the globe going into opposition, a temporary lean in this direction. Such a lean has recently caused the heatwaves in the northern hemisphere, but could get more extreme though for a shorter period of time. The globe in the center of the arc is the lean to the left, which likewise has occurred earlier this year and which will come back into play during the forthcoming rattled wobble. And the globe on the left, with the diminished white dot, is showing the lean that can be expected when the Earth's S Pole deforms and seems to disappear entirely. For Speyer in Italy, this is a depiction of the passage, in short form. The slinging orb on either side is Planet X, first as it entered the solar system in 2003 with its retrograde orbit, and on the left as it leaves. The Earth found herself on the opposite side of Planet X in the spring of 2003, but for the passage the hapless Earth will be on the same side. Technically speaking, Planet X is closer to the Sun while it creeps past on its way outbound, but for this crop circle, which is a short form, the depiction is inbound/outbound end of story." "This is clearly not a symmetrical design, and this is its message. The whole design curves as though on the end of a pendulum. There is movement at a greater angle within the overlapping circles too, implying that the overall pendulum swing is a composite of forces. This irregularity has been a frequent component during the 2010 season, because the rattled wobble has begun. Those who have noticed the weather, the position of the rising Sun, and the erratic orbit of the Moon sense in this design what they are feeling. something is affecting the Earth, which like the end of a pendulum is not in control of the motion." "Comparing these two very similar crop circles, one can see the progression. In Saskatchewan on August 8, 2003, Planet X had arrived at the Sun, but was at the opposite side from the Earth, whereas in Winters on August 2, 2010 it is outbound, moving away from Sun. Which pole Planet X is pointing at the Sun can be seen in the key insignia. The N Pole is pointing at the Sun in 2003 but away from it in 2010. The Sun's ability to buffer the Earth from the magnetic effects of Planet X can also be seen, in that in 2003 there are 3 rings around the Sun insignia, shown as leaning slightly towards Planet X, but in 2010 there are only two rings. The portion of Planet X's magnetic influence that the Sun cannot buffer is seen as broken out, in front of Planet X as a single ring. This is what is bombarding Earth at present." "Designs where overlapping circles are crowded to one side are being repeated for emphasis because this design has proved to be one that humans understand, intuitively. The normal rounded appearance of a magnetic field, where magnetons spew out of the N Pole and wrap in a rounded manner along the field to enter the S Pole, changes when two magnetic fields clash. Mankind is familiar with this concept when looking at the simulation of the Earth's magnetic field and seeing it blown back away from the Sun into what look like wings. During the clash of magnetic fields between the Earth and Planet X, this distortion where wings are on the far side from the Sun but the Sunside shape is rounded will change. This has already occurred, of late, when a portion of this bowshock became deformed. Consider the bowshock, the tight rounded shape of the Earth's magnetic field facing Sunside, to be the point where the circles in these crop circle diagrams are crowded to one side. "Fano, Italy is the simplistic form. Pewsey Whitehorse is showing what happens to the Earth during this magnetic onslaught when it attempts to lean away into the 3 days of darkness or into opposition. A flip-flop or reversal is implied. Stanton Bridge is depicting the lean to the left, with the inevitable recovery which can be a lean to the right." "This design represents the magnetic trimesters, without a doubt. The triangle in the center is the clue. Mankind has recently become aware of what they called a magnetic river just outside the solar system, which we have explained is a part of a very large magnetic field, a flow line of this field, which the solar system is within. This is the reason the Sun and all the magnetic planets in the solar system align in the directions they do. "A careful check of this crop circle in Horton shows that the ribbon wraping around the circle is not evenly spaced. In some cases, the triangle points or the line at the mid-point of the triangle sides are pointing ever so slightly ahead of where the ribbon terminates in a solid leading edge. We mentioned recently that the magnetic trimesters do not end exactly at the end of an April, an August, or a December end, as of course the Universe is not laid out according to the Gregorian calendar. Here you have confirmation of our statement, in the Horton crop circle." "Is there some significance to these two crop circles, with a similar appearance, being laid only a day apart? They both show the new wobble pattern we have been describing, where the slow roll of a daily wobble in the shape of a figure 8, the Serpentine Dance, no longer applies, but is augmented by what we have termed a pattern of the Earth being rattled. The contents of a box, being shaken. Translate this to the Earth, which has multiple dictates on multiple parts, at times in conflict. During the last weeks, the Earth slows her rotation to a stop because a surface magnet, the Atlantic Rift, is gripped and not allowed to come out of alignment with Planet X. The core, meanwhile, protests! Thus during the week of rotation stoppage the Earth moans in her agony, with these conflicting dictates. "When the Earth leans, temporarily, to the left or into opposition, are all her parts in agreement? If, for instance, the core wishes to lean into opposition, for comfort, but the crust find the presentation of the magnetic S Pole on the surface not aligning nicely with the demands of the magneton flow from the N Pole of Planet X, what happens? There is tension, in the magnma, which may merely roil but can result in a snap. This snap, where the magma releases its hold on the crust, translates to plate movement. This is why we warned that the end of the Serpentine Dance in July would result in plate movement. Look closely at the two new crop circles in question. In Norway the center circle, identified with the tuft of wheat still intact, is in different places vs a vs the other circles, which represent the various places where the surface would like to be! The rattling wobble takes many forms, and switches about, sometimes within hours, and certainly cannot be predicted." "This crop circle represents the severe wobble, in terms that mankind can understand at a glance. We have described the Earth laying on its side, during the lean to the left, but prior to this point, for the 9 days of the severe wobble, the Earth will attempt to lean to the left to this degree. Then it will bounce back a commensurate distance, then lean to the left again, etc. so that it is literally flopping back and forth on a day to day basis. What the pendulum beneath this swing shows is the stable and normal point for Earth, as a contrast." "The ancient symbol of a Winged Globe was assumed by many to be merely a symbol of a traveling planet, Nibiru, but has recently been revealed to be the actual appearance of this approaching monster. Thus, the Avebury crop circle is making this statement. Today, a sighting of Planet X is most often of a Second Sun, which is sunlight glinting off the massive dust cloud. The Second Sun is always reflecting sunlight off a part of the complex, and is therefore merely a blaze of light from a single source. But increasingly, as Planet X approaches the Earth, squeezing Venus toward Earth and closing the gap so that more of the shrouded Planet X complex can be seen, it will take on the appearance of the Winged Globe in the skies. Many crop circles have alluded to this image, taking the shape of a bird in flight with a long trail streaming behind and the like." "This shows the passage of Planet X, from its entry into the solar system in 2003 to its turnaround to its second pass and thence to its exit from the solar system. As we have mentioned, Planet X adjusted its trajectory when it approached the solar system, to avoid particle crowding at the Sun's Ecliptic. It approaches the solar system at a 11° angle, inbound from the direction of Orion, dropping so that when it passes through the solar system it crosses at a 32° angle, and then returns to the 11° angle on its return trip back to its second foci. The large circles represent the two foci of Planet X - your Sun and the Sun's dark binary twin. The gyrations of Planet X during its dual 270 rolls is also shown." "This design is clearly showing the Dark Twin during the passage. The Dark Twin is shown opposite the Earth, identified not only by being on the opposite side of the Sun but by the counterclockwise orbit direction that they both assume. In this diagram, Planet X is shown entering from the lower right, moving slowly past the Sun and doing dual 270 degree rolls. We have mentioned that the Dark Twin is caught in the cup with the Earth and Venus, but that both will escape prior to the pole shift. We have also mentioned that the Dark Twin has moved outside of the orbit he shares with the Earth at this time, to escape the current crowding. In fact, the Dark Twin has been captured on film due to this drift outward. This crop circle diagram is showing the escape of the Dark Twin, which will escape in the manner depicted! After moving directly behind the Earth as Planet X approaches, it will seem to disappear into the night sky." "What appear to be dumbbells represent the Earth wobble, which has gotten more violent during the present trimester, the summer trimester ending in late August being the strongest each year. As Nancy has pointed out in her Figure 8 wobble data points, the wobble is not a direct back and forth but a figure 8, slanting this way or that on a daily basis. The angles depicted in the center of Madisonville infer this. Sumatera also shows the wobble, uneven as the N Pole lean to this way and then that occurs during their day. Oudenbosch shows that the passage is not balanced. While fighting through the particle crowded Ecliptic, Planet X encounters not only the Earth in its path, but also Venus and the Dark Twin, which comes up behind the Earth in their shared orbit. The exit of Planet X from the solar system, once the passage has involved the Earth in a pole shift, is swift." "The Netherlands has been host to a series of unique crop circles, laid by makers intent upon relaying a heretofore unstated message. It is hoped that by clustering these circles in one location, in a country normally not the center of focus during the crop circle season, the message may get better focus and attention. "The progression at Hoeven shows the status of the 270° roll, with April 28 being the current status, Planet X having turned 180° to point its N Pole almost directly at the Earth. May 20 shows the full 270° roll with Planet X standing upright during which time it engages the 3 planets caught in the cup including Earth with her Moon. Then Venus escapes and the Moons of Planet X enter the picture. "Oudenbosch is showing this from a different perspective. As Planet X approaches the 3 planets in the cup, the rotation of Earth in her counterclockwise manner creates a clash with the other planets. In this they are not given equal weight, as the rotation clash is primarily with the Earth's Dark Twin." "Etten-leur is telling the tale of the Dark Twin, from the point at the left where it is caught in the cup with the Earth and Venus, to its escape out into space behind the Earth. The Dark Twin then wants to return to its orbit, and does so with a sharp 90° turn, thence moving in the normal counterclockwise orbit, coming closer to the Sun again. It then finds itself gradually positioning itself on the opposite side of the Earth in their shared orbit." "This genuine crop circle has been modified by the makers a day after it was first laid, for emphasis. This is a timeline image, as most linear images are. Clearly, in the center, something almost violent has occurred, a sense of a vertical flip. Starting from the left, the two circle-within-a-circle orbs show an attempt to escape, caught in the larger circle, pressed to the side. The progression shown by the addition to this design emphases that attempting to escape by changing position, the flip, will not work for long. This crop circle relates to the planets caught in the cup - Venus, Earth, and the Dark Twin. Venus will seem to be out of place and then loom close to the Earth. The Dark Twin, which normally follows the Earth in their shared orbit, is currently outside their shared orbit, further out in space. It may even move ahead of the Earth, temporarily, before being squeezed out of the cup to escape." "The clue to interpretation of this stunning crop circle is the emphasis on 3 parts, which we have stated refers to the magnetic trimesters. Almost equal in duration, occurring approximately four months each during the Earth year, they differ in strength. This design is relating them to the wobble, and the pressure the Earth is under while attempting to lean her N Pole away from the magnetic hosing from Planet X. The trimester ending in April is the mildest. This is followed by the strongest trimester, the Summer trimester ending in August, during which the wobble will be most forceful. Then the force eases for the Fall trimester ending in December." "The Stavropol design specifically relates to its location in Russia - between the Caspian and Black seas. As the Arabian Plate shifts during the 7 of 10 plate movements, the pointed top will tumble the oil fields of Iraq, as we have so long predicted. The moving point, like a sickle, will apply pressure to the lands between the Caspian and Black seas first from the west, then arriving at the eastern side of the point to apply pressure there. Since the areas where the circle was laid is not on a fault line, this will be confusing for those living there, and this crop circle seeks to give them a clue as to the cause of their earthquakes and land adjustments." "How close will Venus and the Dark Twin come to Earth during the time when they are crowded together in the cup, before they escape, and what will the Earth do in reaction to this crowding? There have been many crop circle designs this year on this subject. Venus would normally go around the Sun in a counterclockwise orbit, but is stuck in front of it, between the Earth and Sun. These two postures are depicted on the right. The Dark Twin has fallen behind the Earth, outside of their shared counterclockwise orbit, but has not yet passed the Earth though it might do this during the gyrations to come. "The Earth, depicted in the center in many different postures, is thrashing about, as it is magnetic where the other two planets are not. The Earth is also squeezed between the other two planets. The Earth may attempt to move closer to Venus, when they are all pressed together, as the Dark Twin is nearby and crowding the Earth with Repulsion Force conflict. But ultimately, it is a more severe wobble which will ensue. The wobble is shown in the half-circles. The wobble will worsen when Earth is pressed toward the Dark Twin during the approach of Planet X in his retrograde orbit." "Many crop circles depict the wobble, as this is the immediate and most obvious sign of the presence of Planet X. The establishment has tried to cloud the issue by claiming the erratic weather and rising seas are due to Global Warming, but having the Sun and Moon appear in the wrong place is clearly not caused by the temperature of the Earth's atmosphere. In the Barbury design the Earth is primarily leaning away from the approaching Planet X, the cooler weather for the northern hemisphere we predicted. But on occasion, as she did recently, she points her N Pole toward the Sun and the oncoming Planet X, leaning into opposition. This influence, the influence of Planet X's magnetosphere, is dominant for the Earth, unlike any influences from her sister planets - Venus and the Dark Twin, which are also shown. The Dark Twin stands behind the Earth at present, and Venus to the side." "Both Chaddenwick and Windmill Hill are showing a switching back and forth between a counter clockwise and clockwise swirl. In Chaddenwick this occurs once, from counterclockwise (the normal rotation and orbit of Earth) to clockwise (the rotation and orbit direction of Planet X). Windmill Hill does this twice, from counterclockwise to clockwise and round again. "This emphasis is demonstrating the dominant force that the Earth is encountering. Planet X is 23 times Earth's mass, 4 times her diameter, and is the bully without question. As Planet X approaches there is a clash in rotation direction, which ultimately brings the Earth to a stop in her rotation during the Last Weeks. Stonehenge is depicting the Earth wobble, once again. The sense of switching back and forth is unmistakable, and almost dizzying." "This crop circle design is stating that the swirling dust cloud of Planet X will seem to dance like a snake, from the viewpoint of Earth, as Planet X comes closer and the Earth's wobble intensifies. Planet X seems to come from the Sun, on the left, with the view from the Earth thus on the right. The dust cloud reacts to the Earth's magnetosphere by swinging first to one side, then the other, as the Earth wobbles. The dust cloud is most attuned to Planet X, hosing out from its N Pole which streams magnetons outward. But it is also blown about by the solar wind and tends to trail the moving Planet X. The dust cloud would normally be attracted to the Earth's S Pole, which is a magneton intake, but as the S Pole is moving back and forth during the Earth wobble, the dust cloud swoops to this side or that. The snake head represents Planet X itself, with the double helix of its major moon swirls on either side of the corpus. The twisting tongue of the snake showing that the charged tail of Planet X seems to roll as well as swoop, a complicated dance." "Depicting the merging magnetic fields of Earth and Planet X, the Wayland crop circle shows the area of turmoil where the fields overlap. Magnetic particles become confused, heading first one way and then another, in this zone. Where this confusion has been exhibited on the Magnetosphere Simulator in Japan for some months and years, it has only become increasingly obvious to the general public very recently."